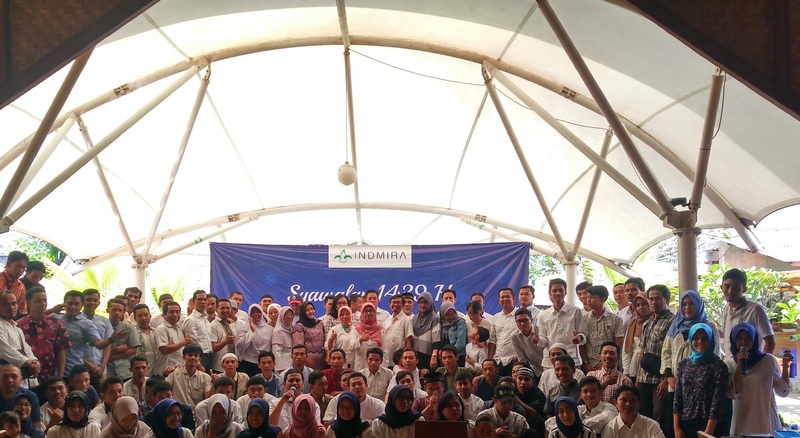 Indmira holds a Syawalan (Community Observance of Ied Al-Fitr) celebration for all employees, including those of the subsidiaries, Amboja Farm, Atnic, and CNN. The party is held at Mang Engking Soragan Castle on Saturday 23 June 2018. Mrs. Ir. Endang Tantrawati, PT. Indmira President Commisioner, gives the next speech to thank everyone in attendance. She also welcomes new employees and wishes them the best and speedy adjustment to PT. Indmira big family. The last opening speech is presented by the Vice Director, Mr. Andi Nusa Patria. He hopes that the tight bonds among personnel stay and increase the spirit of all employees in PT. Indmira group. The next activities include getting to know each other, such as introducing the new employees. There is also a history lesson, in which long time personnel members recount their experiences working in the company, from a humble beginning to the current one. At the end, this familial Syawalan gathering will have positive impacts on the spirit of all members of PT. Indmira big family.